The Centre Block on Parliament Hill will be undergoing extensive renovations, which are expected to last at least 10 years. It will be closed for that entire period. We have heard concerns that one or more mature trees near the structure may be removed for ease of access to the building or to otherwise facilitate the renovation process. 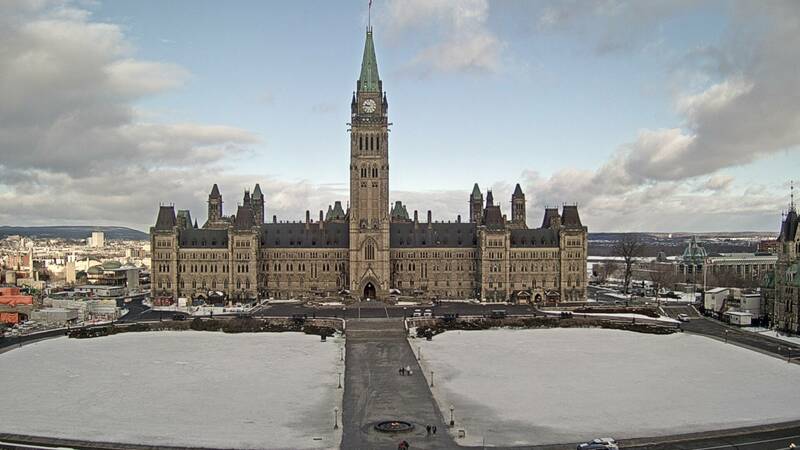 We are particularly concerned about a mature elm, which stands just to the east of the Centre Block, near the statue of Sir John A. Macdonald (shown just to the right of the Centre block in this recent image from the Hill cam), and more close up in the image further down. It may be just one tree, but its location, historical significance and symbolism make it a distinctive tree worthy of preservation. Parliament Hill, in addition to its national importance as the location of the seat of government and as an exceptional built heritage and tourism feature, is also a significant greenspace in the heart of the Capital. Every one of its natural features, including individual trees, ought to be given the utmost protection. This is particularly significant in the face of the loss of mature trees in Ottawa, which is approaching crisis levels in the core area, much of it due to infill and renovations. And doubly significant in the face of the climate change emergency we all face. The federal government could lead by example as a wise steward of greenspace under its care by preserving this distinctive heritage tree. To signal our concern, we wrote a letter to the Chief Executive Officer of the National Capital Commission, which exercises planning oversight regarding the Capital Domain. We received an acknowledgement and a referral to the Executive Director, Capital Planning, with whom we will now follow up on means to preserve this tree. We have received a letter from the NCC confirming that it is reviewing, along with the Federal Heritage Building Review Office, a proposal from Public Services and Procurement Canada regarding tree and monument relocation on Parliament Hill. The NCC has a clear mandate to protect trees and greenspace on Parliament Hill, but we are not convinced that they will be able to withstand the pressure from PSPC to make space for staging areas and access to the Centre Block by removing this centenary elm and other mature trees. As we are facing a climate emergency, we cannot afford to lose any more mature trees. There are strong parallels between developers/landowners removing trees for renovation or infill in the city core, and the federal government doing the same on Parliament Hill. By saving this tree, the federal government would be setting the example. To raise public awareness about this risk to mature trees on Parliament Hill, we issued a press release today. In coming days, we will work with partners to ensure that the decision to remove or save this tree is taken in the clear light of day, not behind closed doors. 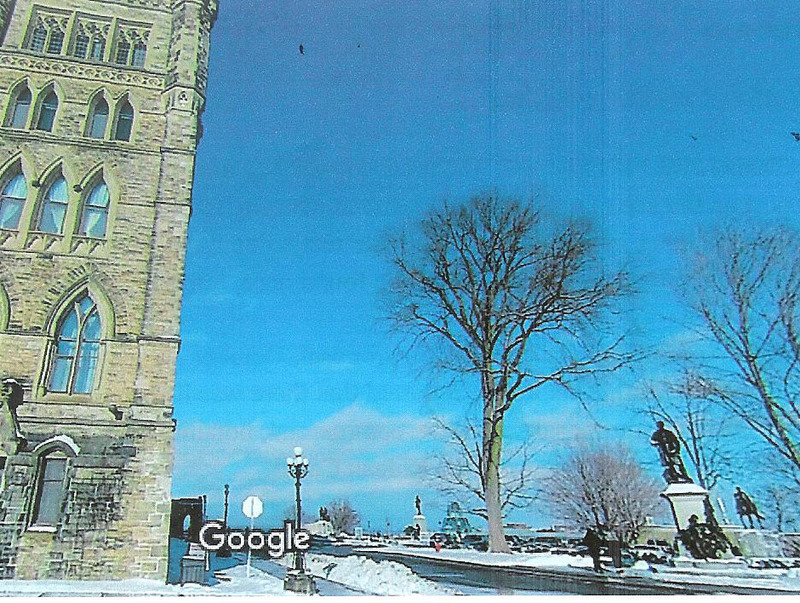 As a result of the media coverage following our February 4 press release, Public Services and Procurement Canada has issued a statement saying that they are indeed recommending that the centenary elm be removed as part of the Centre Block Rehabilitation project. In support of their argument, they released information on an arborist’s report from September 2018 that claims that the tree is in poor condition and is unlikely to survive another five years. We seriously question this assessment and have written a letter to the new CEO of the National Capital Commission, Tobi Nussbaum, calling on him to release any additional information they may have on the condition of this tree given that they have been responsible for its maintenance over may decades. We do not believe that the tree is in such poor condition that it should be destroyed. Rather, we call for it to be preserved and protected. Following our learning event yesterday at the base of the centenary elm, we received a number of offers of assistance from very knowledgeable tree experts. As we question PSPC’s assessment that the tree is in poor health, we sent a letter today to Jennifer Garrett, the PSPC Director General responsible for the Centre Block Rehabilitation project, asking her to release the arborist’s report on which this assessment is based, so that it can be subjected to a peer review of sorts. Our view is that any decision to remove this tree must be based on much more solid evidence than what we have seen to date. The University of Guelph, which lists food, agriculture and the bio-economy, and environmental stewardship and biodiversity as signature fields of research, has, for the last 20 years, operated the Elm Recovery Project. This project seeks to identify surviving large elms across Ontario and screen them for resistance to Dutch elm disease. As they find disease-tolerant specimens, they collect genetic material to boost local gene pools with pollen from these elms. The goal is to speed the natural recovery of the elm population as the favourable traits of these trees are passed on to the next generations of genetically diverse elm seedlings. The Elm recovery Project currently has 800 large elms listed in its database, including some in the Ottawa area. For some reason, it did not include, until now, the centenary elm on Parliament Hill. Upon hearing of this mature survivor of Dutch elm disease, they were keen to add it to their inventory. Arrangements would now need to be made to have the elm screened through inoculation to determine if it is disease tolerant, which is something we will ask PSPC to undertake before making any final decision about the elm. Should it be found to possess these favourable traits, it should at minimum be preserved until spring so that pollen can be collected when it next flowers. This 1979 video from CBC Archives shows the devastation that Dutch elm disease visited upon the elm population on Parliament Hill and all around Ottawa 40 years ago. We learn from it that of the 100,000+ trees lost to the disease or cut down to prevent its spread, 2,000 were earmarked by the NCC for preservation. These trees were sprayed to kill the type of beetle that carried the fungal disease and then injected with fungicide, a treatment that had to be continued over the years. The centenary elm on Parliament Hill was no doubt one of those that was saved. How many of the 2,000 are still alive today? Is the centenary elm on Parliament Hill one of 3, one of 10 or one of 100 elm trees surviving on federal lands in the national capital? It is of vital public interest that the federal government ascertain how many survivors remain before making a decision to remove this centenary elm. We have received a response to our letter of February 10 from NCC CEO Tobi Nussbaum. Unfortunately, he gave no direct response to any of our queries and all but confirmed that the NCC will give federal land approval to the PSPC plan, including the removal of the centenary elm. We gleaned new information from his response however regarding those plans. It seems that a large excavation is planned in the area where the elm is located to accommodate a new below grade visitor welcome centre. We will have the opportunity to verify this when we meet with the PSPC DG responsible for the project on February 26. That the Centre Block rehabilitation project includes the construction of large below grade visitor welcome complex that would stretch from the recently completed four story below grade visitor centre next to the West Block, across the front of Centre Block to another large below grade visitor centre to the east of Centre Block. The footprint of this eastern visitor centre would cover pretty much the whole of the north east corner of Hill, hence the need to remove ALL the vegetation in the area, including the centenary elm (regardless of condition or health ultimately). That the plans for this part of the project are very preliminary, with very little information publicly available. That the project activities over the next 9 to 12 months consist of 30 or so discreet preparatory projects, such as making an inventory and imaging the heritage features of every single room in the Centre Block), no shovels in the ground. PSPC shared with us three individual assessments they had done of the centenary elm, all in September 2018. An assessment done on September 1 concluded the tree was in fair condition. The one done on September 17 concluded it was in poor condition, as did one on the basis of a quick visual inspection on September 26. We note that between August 31 and September 20 2018, the Ottawa Weather Office reported very little rain (12mm in all) and two five day stretches of hot sunny weather, with daytime highs ranging from 26 C to 32 C. It would not be surprising to find the tree under increasing water stress by the end of the month. The Parliamentarians themselves, through the Speaker of the House and the Speaker of the Senate, are ultimately responsible for the programming or functional requirements for this new space. PSPC is building to those requirements and in a sense have no leeway in terms of preserving the existing greenspace in the area of the centenary elm unless the requirements are changed. All of this has led us the conclusion that, having exhausted all bureaucratic channels, this fight must now be taken to the political level. The Greenspace Alliance, along with Ecology Ottawa, Community Associations for Environmental Sustainability (CAFES) and the Ottawa Field Naturalists’ Club, have sent a letter to the Speakers of the House and Senate, and to the members of the Permanent Committee on Procedure and House Affairs, calling for an immediate halt to any vegetation removal on the Hill and a reconsideration of the plan to build a large, multistory, below ground visitor center in the space where the centenary elm now stands. This new development in the campaign to save the centenary elm was the subject of a press release and an update to our petition. We were hoping to get the attention of Parliamentarians as the House came back in session on Monday March 18. Our previous correspondence had not yet borne fruit. So we thought of following up with the Permanent Committee on Procedure and House Affairs. In so doing, we discovered that the committee would be meeting on Tuesday March 19 and that the Centre Block Rehabilitation Project was on the agenda. We immediately sent a letter requesting that the topic of the centenary elm be put on the agenda, with an attachment summarizing the conflicting and inconclusive evidence that was the basis for the judgement that the elm was in very poor condition. This correspondence was immediately acknowledged and we learned from the committee Clerk that the material had been circulated to all members of the Committee. We attended the meeting on March 19 as observers, as witness lists are fixed in advance. That was a pretty extraordinary outcome. The Emergency meeting has now been scheduled: Thursday March 21 at 11:00. The Emergency meeting on March 21 was cancelled because of the overnight voting marathon on the budget. It has been rescheduled to April 2, so we will still have our day to make the case for the centenary elm and the 13 other mature trees slated for removal: 10 sugar maples, one red oak, a silver maple and one white birch. The good news is that PSPC has confirmed that it will observe the moratorium called for by the Standing Committee on Procedure and House Affairs. So a small win there. We still plan to deliver our petition to Minister Qualtrough this week, emphasizing that all the trees in that green enclave next to the Centre Block should be spared, not just the elm. Yesterday, without notice, PSPC cleared almost all of the vegetation from the area of the centenary elm, fenced it off and turned it into a construction zone. Only the elm and a few other matures trees remain standing. We were somewhat taken aback given our exchange of correspondence on March 25. PSPC then sent this letter after the fact, on March 26, justifying their action. The PROC meeting on April 2 is still proceeding and we will be appearing as witnesses, as will PSPC senior management. This should be very interesting! Our position does not change. We will be calling on Parliamentarians to reassess the trade off between preserving, and now restoring, greenspace around the centenary elm and extending the new underground visitor centre into that area. We issued this press release today. Leading up to the meeting of the Parliamentary Committee tomorrow, April 2, we are getting good media coverage for the preservation of the elm. This National Post story was published late in the day on March 26, right after the clear cut on the Hill. CBC Radio ran this story today, including a nearly 8 minute segment which ran on CBC Ottawa Morning in a prime morning time slot. Our appearance at the Standing Committee on Procedure and House Affairs took place on April 2. The Chair of the Committee, Larry Bagnell, Liberal MP from the Yukon, was very keen to have this meeting scheduled and the issue addressed. So it was a little surprising that after all the presentations had been made and questions answered, all five Liberals on the committee, including one who was brought in on an emergency basis at the very end of the meeting, voted down a motion to delay the removal of the elm until after leaf out so that its condition could be assessed conclusively. This article gives a good summary of what happened. So the elm will likely be removed by April 12. Not to give up and to keep faith with the nearly 600 Canadians from across the country who signed our petition to save the elm, we sent Minister Qualtrough a last ditch appeal for her to consider the information that was actually presented at the PROC meeting and maybe grant the centenary elm a reprieve.